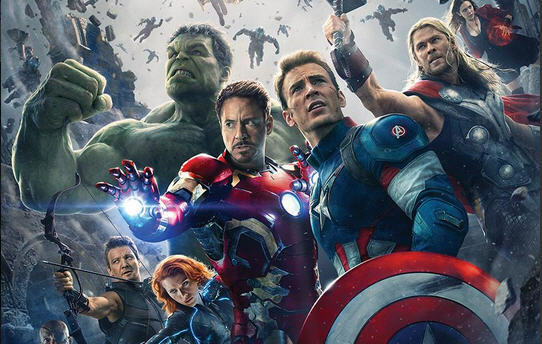 Marvel unveils new poster for "Avengers: Age of Ultron"
The Avengers are assembled in the first official poster for "Avengers: Age of Ultron." Marvel unveiled the artwork Tuesday, and includes a glimpse of a new superhero among all our old favorites. That newcomer is The Vision (Paul Bettany), who appears to be floating above Hulk (Mark Ruffalo) in the poster. Quicksilver (Aaron Taylor-Johnson) and Scarlett Witch (Elizabeth Olsen) also join in this sequel, and the credits at the bottom also reveal that we'll see Anthony Mackie (The Falcon), Idris Elba (Heimdall), Stellan Skarsgard (Dr. Eric Selvig) and Hayley Atwell (Peggy Carter) all reprising their roles from other films in the Marvel universe.